Yom Yerushalaim (Jerusalem Day) is an Israeli public holiday celebrated on the 28th day of the Hebrew month of Iyar. It commemorates the liberation of the Western Wall and the Old City and reunification of Jerusalem during the Six-Day War. After the First Arab-Israeli war (known in Israel as War of Independence) Jerusalem was left divided between Israel and Jordan. The Old City of Jerusalem was occupied by Jordan and the Jewish residents had no access to the sites of key religious importance, the Temple Mount and Western Wall. During the Six-Day War in 1967 Israel liberated Jerusalem on 7 June 1967 (28 Iyar 5727). The war ended four days later. Jerusalem Day was proclaimed by the Israeli government in 1968. It is celebrated on the Hebrew date on which Jerusalem was liberated and reunified, which occurs on a different date of the Gregorian calendar every year. In 1998 Yom Yerushalaim became a national holiday. Celebration of Jerusalem Day includes memorial services, state ceremonies, and a large parade through downtown Jerusalem. 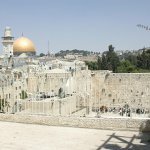 The Chief Rabbinate of Israel ruled that the whole Hallel be recited with the accompanying blessings to mark the regaining of access to the Western Wall, the Israel's holiest shrine.